A good script and cast combined with a unique and interesting story is a winning combination and a film every teenager and their parents should watch. If one wanted to make a movie from a successful Young Adult novel there is a plethora of source material to choose from. 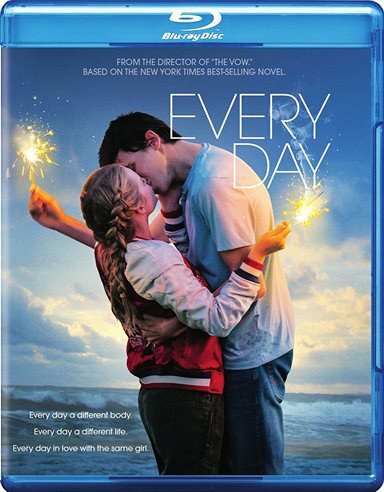 One such option is author David Levithan's Every Day. The novel, a New York Times Best Seller, tells the story of A (numerous actors throughout the film) a teenager who wakes up every day in a different body. Because of its unique concept and popularity, the book was destined to be made into a feature film and Director Michael Sucsy (The Vow) managed to do it in a warm and endearing way while keeping with the story's theme about it not mattering who we choose to love. Rhiannon (Angourie Rice; The Nice Guys) is your typical teenage girl whose dating and home life are less than ideal. Her dad is clinically depressed and hasn't worked in the past several years and her boyfriend, Justin (Justice Smith; Paper Towns), is inattentive and selfish. Most of the time he either ignores her or uses her but one day they skip school and he is suddenly the perfect boyfriend. Of course the next day he is back to his cruel self. A few days later Rhiannon meets a stranger and her world is turned upside down making her rethink everything she has ever known. 'A' is an entity that changes bodies every day. Always a teenager, sometimes a girl, sometimes a boy and never the same body two days in a row. It never has a problem moving on, meeting new people but tall that changes when it meets Rhiannon. 'A' forms a connection with her and tries to see her every day. When 'A' first tells her what is happening she doesn't believe it but eventually, she knows it is right and they form a bond. They spend as much time to gather as possible. After one of the bodies, 'A' inhabits contemplates suicide 'A' learns to stay in one person for more than one day and when it finds a boy that it knows Rhiannon would like, it stays there until both Rhiannon and 'A' realize they can't be together forever since it is not fair to the person 'A' is inhabiting. 'A' eventually leaves but Rhiannon has been changed forever and looks to heal her parents relationship as well as find a healthy one of her own. The movie starts out confusing but after about 15 minutes the audience learns what is going on and then it becomes rather interesting. We witness as 'A' becomes a new person each day and how that affects A's relationship with Rhiannon. We also see Rhiannon grow, mature and evolve as a result of her relationship with 'A'. The whole concept is fascinating and makes you wonder what if there really were people like that our there. Rice is good as the lead character through some of her more emotional scenes fall a little flat like when she tells Justin about her dad's mental illness and her family life. Debbie Ryan (Jessie) plays a different type of role than we have seen her in the past and it is a refreshing change. Instead of portraying the typical Disney goodie two shoes she instead plays an obnoxious foul-mouthed older sister. Smith is good as the boyfriend we all want to hate anti is fascinating to see 15 different actors play 'A'; each unique in their own right yet somehow cohesive thanks to a well-written script. The Blu-ray video quality is 1080p resolution with a 2.39:1 aspect ratio. Colors are vivid and clean. The DTS-HD Master Audio 5.1 is clear and sharp as dialogue is delivered via the center channel. The Blu-ray has a few extras but most are short and leaves the viewer begging for more. I would have liked to have seen more in-depth discussion from the cast and crew. The film was a surprise for me as I didn't expect to like it as much as I did. I felt connected to the characters and their plight and while the script is partially a political statement about acceptance and loving whoever you want, it is neither peachy nor "in your face" about it. It disguises a lesson about acceptance as a coming of age, young adult romance. Download Every Day from the iTunes Store in Digial HD. For more information about Every Day visit the FlickDirect Movie Database.